The biggest challenge many companies face with maturing IT service management (ITSM) is determining which processes to mature and how much process formality is required. Info-Tech’s primary research has identified a few, simple steps to improve service management maturity. Info-Tech’s ITSM research is organized into an easy-to-understand Onion Model that IT leaders can use to assess their current practices and plan improvements. 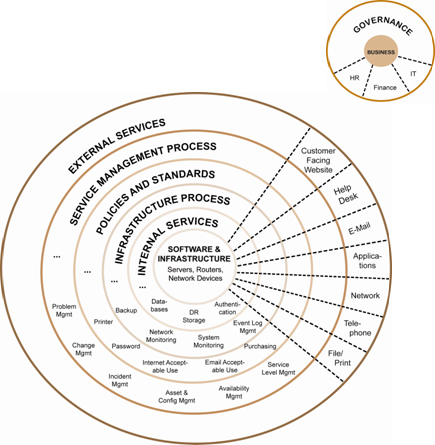 Rather than peeling from the outside-in, service management improvement happens from the center of the Onion, core infrastructure services, and works towards the outside, to establish business-facing IT service alignment. …understand why service management matters. Impact Report #1, “ITSM: Why You Should Care” explains the benefits and pitfalls of maturing service management. …ensure solid infrastructure process at the core. Impact Report #2, “ITSM: Core of the Onion” provides specific guidance on key activities at the core of the Onion Model. Impact Report #3, “ITSM: Key Processes” provides direction on service management process improvement. Specific processes covered include change management, incident management, asset management, configuration management and problem management. Impact Report #4, “ITSM: Governance of IT Services” covers key considerations about service management services and governance. Specific topics covered include service level agreements (SLAs), service catalogs, service portfolios, application portfolios.